Vilna had already become a preeminent center for rabbinical studies by the beginning of the 17th century. Among the scholars born in Vilna were Joshua Hoeschel Ben Joseph and Shabbetai Ha-Kohen, who served as dayyan of the community. The Rabbi of Vilna in the middle of the 17th century was Moses B. Isaac Judah Lima. Among the scholars of Vilna in the second half of the 17th century and the beginning of the 18th were R. Moses, called Kremer, his son-in-law Joseph, author of Rosh Yosef, Halakhic and Aggadic novellas; R. Baruch Kahana, known as Baruch Charif; the grammarian Azriel and his two sons Nisan and Elijah, and Zvi Hirsch Kaidanover. From the second half of the 18th century the personality and activities of Eliyahu ben Solomon Zalman, the Gaon of Vilna, who attracted numerous disciples, had a lasting impact on Vilna Jewry. The circle thus formed became the most stimulating religious and spiritual center there and had a profound influence on Judaism, especially in the domains of the Halakhah and Kabbalah. 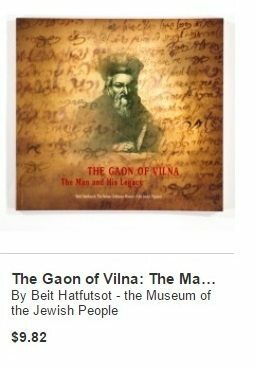 At the end of the 18th century, under the influence of the Gaon, Vilna became the center of the way of life and system of religious study followed by the Mitnaggedim and the focus of their struggle against Hasidism. In 1772 the Kahal disbanded the congregation formed in Vilna by the Hasidim and issued a ban or excommunication against them. Bitter opposition to Hasidism continued throughout the lifetime of the Gaon. Nevertheless, groups of Hasidim still assembled clandestinely in Vilna and formed their own minyanim, and after 1790 the movement even found support among members of the Kahal. In 1798 the Vilna Kahal was prohibited from imposing fines or corporal punishment for religious offenses. When the Hasidic leader Shneor Zalman of Lyady was denounced to the authorities and imprisoned, 22 Hasidim from Vilna and its environs were also incarcerated, although afterward released. The Kahal elders and dayyanim were dismissed from office in 1799, and the Kahal accounts were examined. A new Kahal was then chosen from among the Hasidim, which controlled the Vilna community for over a year. Subsequently the two parties became reconciled and a new Kahal was elected with representatives of both parties. The Hasidim were permitted to form their own congregations. Vilna’s preeminence as the seat of Jewish learning continued in the 19th century. As an important center of Haskalah, it attracted many Hebrew writers. When the government commenced its policy of Russification of the Jews, it made Vilna a center of its activities. Max Lilienthal was sent there in 1842 to encourage the establishment of modern schools and in 1847 a government sponsored Rabbinical seminary was established. The restriction limiting Jewish residence to certain streets in Vilna was abrogated under Alexander I in 1861. It was in this period that the first Jewish socialists in Russia began to be active in the official Rabbinical seminary, among them Aaron Samuel Liebermann and his associates. Anti-Jewish riots took place in 1881 when a band of military conscripts attacked Jewish shops. The Jewish butchers, who organized themselves to oppose the attackers, turned them over to the police. The 1897 census shows 63,831 Jewish inhabitants, 41.9% of the total population. The congested conditions and increasing unemployment led to large-scale emigration. Large numbers left for the United States and South Africa, and a few went to Palestine. Vilna became an active meeting ground for Jewish socialists in the 1890s. A convention of Jewish social democrats was held in 1895, while in 1897 the Bund Labor Party held its founding convention and Vilna became the center of its activities. At the beginning of the 20th century Vilna became the center of the Zionist movement in Russia, and saw the rise of a flourishing Hebrew and Yiddish literature. 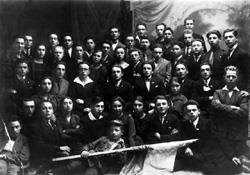 One of the first societies of the Hibbat Zion movement was founded there; Chovevei Zion conventions were held in Vilna. Theodor Herzl, who visited Vilna in 1903, was given an enthusiastic popular reception. The central bureau of the Zionist organization in Russia functioned in Vilna between 1905 and 1911 and for some time the Po’alei Zion Party made Vilna its headquarters. The well-known Zionist leader Shmaryahu Levin was elected as deputy for Vilna to the Duma (Russian Parliament). Orthodox circles were organized under the leadership of R. Chayyim Ozer Grodzenski, and afterward were amalgamated with the Agudat Israel. Vilna became a transit center and asylum for Jewish refugees from the vicinity during World War I. Under German occupation lack of food and discriminatory levies on the Jewish population made conditions increasingly difficult. The situation was not improved after the war when the struggle between the Poles and Lithuanians for the possession of Vilna (1919-20) entailed frequent changes of government. In April 1919, 80 Jews were massacred by Polish troops. The inter-war period from 1922 to 1939 was a time of fruitful and manifold social and cultural activities for Vilna Jewry. This period saw the establishment of a network of elementary and secondary schools in which Hebrew was either the language of instruction or the principal language, and of Hebrew and Yiddish teachers’ seminaries and trade schools. Vilna was a world center for Yiddish culture. The YIVO Research Institute for Yiddish language and culture was founded in Vilna in 1924. With the outbreak of World War II, Soviet Russia invaded Vilna and in October 1939 ceded it to Lithuania. Jewish refugees from divided Poland – The German-occupied part and the Soviet-occupied one – found refuge in Vilna. In June 1940, Lithuania was annexed to the USSR the Soviet authorities closed down Hebrew cultural institutions and Zionist organizations. All Yiddish press was replaced by the Communist party’s organ. Many Jews, active Zionists, Bundists, and “Bourgeois”, were exiled in 1941 to the Soviet interior and many were confined in camps there. On June 24, 1941, the Germans entered Vilna and were welcomed by the Lithuanian population with flowers and cheers. 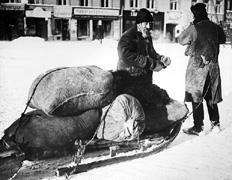 Persecution of Vilna’s Jewish population (approximately 80,000) began immediately. 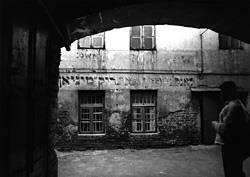 Prior to the establishment of the ghetto, about 35,000 Jews were murdered in Ponary. In January 1942 the various political organizations in the ghetto created a unified fighting organization, F.P.O. (Fareynigte Partizaner Organizatsye), commanded by Yitzchak Wittenberg, Joseph Glazman, and Abba Kovner. In the beginning, the F.P.O. decided to fight in the ghetto rather than escape to join the partisans in the forests. In addition to smuggling in ammunition, the F.P.O. carried out acts of sabotage, issued an underground bulletin, and forged documents. On July 5, 1943, Wittenberg, the commander of the F.P.O., was arrested. While he was being led out of the ghetto, the F.P.O. attacked the guard and freed him. Realizing that a price would have to be paid for this act of defiance, the underground ordered mobilization of all its units. The Germans issued an ultimatum for Wittenberg to surrender by morning or the ghetto would be wiped out. After hours of difficult deliberation, Wittenberg surrendered himself to the Germans and was murdered by the Gestapo. The F.P.O. then decided to evacuate to the forests. On September 1st, 1943, the Ghetto was sealed off. The F.P.O. was mobilized at once, and in the morning the German soldiers entered. Fighting erupted in several areas of the ghetto. Jacob Gens, Chief of the Jewish Police successfully petitioned the Germans to leave. Gens was the ghetto’s most controversial figure. Some condemned him as an outright German collaborator, while others regarded him as a man who fulfilled German orders in an effort to save as many Jews as possible. Accused by the Gestapo of aiding the underground, he was shot on September 15, 1943. During the first four days of September 1943, while 8,000 more Jews were deported to labor camps in Estonia, 200 fighters left the ghetto to join the partisans. On September 15, 1943, the ghetto was again surrounded, but the Germans withdrew when they learned that the remaining F.P.O. fighters were again mobilized for battle. 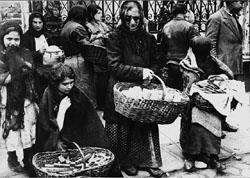 On September 23 the Jews were ordered to prepare for the final deportation, which would liquidate the ghetto. It is estimated that approximately 100,000 Jews from Vilna and the vicinity perished in the Vilna ghetto. After the Soviet army liberated Lithuania (July 12, 1944) about 6,000 survivors from the forests and other places assembled in the city. In the 1959 census 16,354 Jews (6.96% of the total population) were registered in Vilna, 326 of whom declared Yiddish to be their mother tongue. In 1970 the number of Jews was estimated much higher. The only synagogue left generally served a small number of elderly Jews, except on holidays, particularly on Simchat Torah, when many hundreds congregated, including younger people. After the Six-Day War in the Middle East (1967) identification with Israel became more pronounced, especially among the young, in spite of the official anti-Israel campaign, and Jews from Vilna were among those who protested against the refusal to grant them exit permits to Israel. During the Soviet period, before the restoration of Lithuanian independence in 1990, there was not an organized Jewish community. 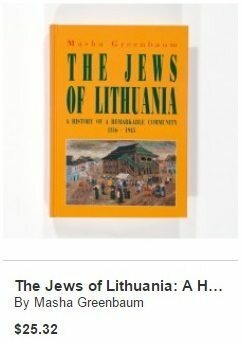 Only in 1989 the first steps were undertaken towards the establishment of a new Jewish community in Lithuania by the founding of the Association of the Culture of Lithuanian Jews. As of November 1991 it became the new Jewish Community of the Jews in Lithuania. The community is governed by the Community’s Council, which is elected by the Conference along with the Chairperson of the Community. The Jewish population of Lithuania is estimated at some 5,000 (6,000 in 1997), most of them living in Vilna. The community is active in a number of fields, among them a special attention is given to maintaining the Jewish national identity and the restoration of the religious life and of the Jewish cultural heritage. The community organizes meetings, lectures, and exhibitions dedicated to an array of subjects including Israel related topics as well as Jewish holidays. Remembering the Holocaust victims remains a top priority of the Jewish community: there are over 200 places of mass extermination on the Lithuanian territory that need to be cared for. Each year solemn ceremonies are held on September 23, the Day of Remembrance for the Holocaust in Lithuania, at the 9th Fort in Kaunas and in Ponary, the sites of the most terrible mass murders of Jews. The Jewish Gaon State Museum, founded in 1989, has also a permanent exhibition on the Holocaust and among various temporary exhibitions “The Jews of Lithuania in the Fight against Nazism” was opened in 2000 to mark the 55th anniversary of the victory against the Nazis. The list of the Vilna ghetto prisoners was published in a new book. Of the cultural institutions and organizations a special mention should be made of the Jewish Cultural Club that attracts Jewish and non-Jewish audiences, of Ilan, a children and youth club, and of Abi men zet zich, a senior citizens club. The Jewish community publishes the Jerusalem of Lithuania – a four-language periodical in Yiddish, Lithuanian, English and Russian reporting the events in the life of the community with a special emphasis on the cultural aspects. Today, again there are Jewish schools in Vilna: The Shalom Aleichem State School has some 200 students. Its curriculum includes in addition to the general subjects, the study of the Hebrew language, the Bible, and the history of the Jewish people. The Chabad community in Vilna runs a private religious school. The Jewish community runs an extensive welfare program in support of its needy members. These are mainly pensioners who either remained alone after their relatives had emigrated to other countries or had been severely affected by the economic crisis that followed the collapse of the U.S.R.R. The aid program includes distribution of food, clothes, financial support, and medical care as well as other free of charge services, among them housecleaning, laundry, etc. The welfare program has been possible thanks to the generous assistance of various Jewish organizations, especially the American Joint Distribution Committee, and private donors. 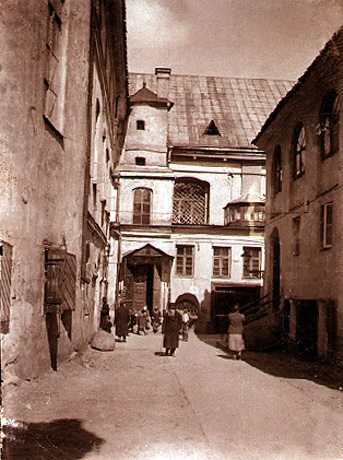 The Old Synagogue in Vilna, Lithuania, built in 1572. Photo taken by the German army during WW 1. 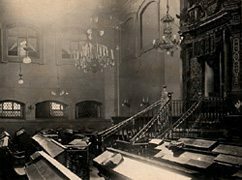 The Great City Synagogue in Vilna was built of stone from 1630 to 1633, after permission was given to build a stone structure to replace the Old Synagogue. In 1635 the synagogue was pelted with stones by rioters, the interior was destroyed and all it contained was looted. It was rebuilt in Renaissance-Baroque style in the schulhoif, and in the course of time it was surrounded by a complex of some twenty synagogues, among them an old wooden 15th century synagogue, rebuilt between the 18th and 19th century, prayer-houses of the artisans’ guilds, a beth-midrash, a mikveh, the community center, the famous Strashun rabbinical library; the prayer-house of Rabbi Eliyahu ben Solomon Zalman, The Gaon of Vilna (1720-1797), built in 1800. The whole complex became a great Talmud Torah study center and the heart of the movement of the Mitnaggedim. The Great City Synagogue was a high one-story building with a slanted roof. In 1800 a gable with a two-tiered wooden portal was added on the western side. The entrance, with a vestibule and the “pillory” was located on the northern side of the building. The main prayer hall was square and could hold 300 people. It had a three-tiered bimah in the center, composed of twelve pillars (some say it was the gift of Rabbi Yehuda Ben-Eliezer), and it was surrounded by four pillars in Tuscan style, supporting the dome. The two-tiered Holy Ark on the eastern wall was a splendid structure, with gilded woodcarvings, representing plants, animals and Jewish symbols, with a double-headed eagle on top. On both sides of the Holy Ark there were two-story structures, serving as the women’s sections, connected to the prayer hall by little windows. Hanging from the walls and ceilings there were numerous bronze and silver chandeliers. The synagogue contained a valuable collection of ritual objects. The building was repaired in the 19th century. In 1846, when Moses Montefiore (1784-1885) and his retinue visited the synagogue, the treasurers distributed entrance tickets to the masses of people. The synagogue was partly destroyed by the Germans during World War 2. 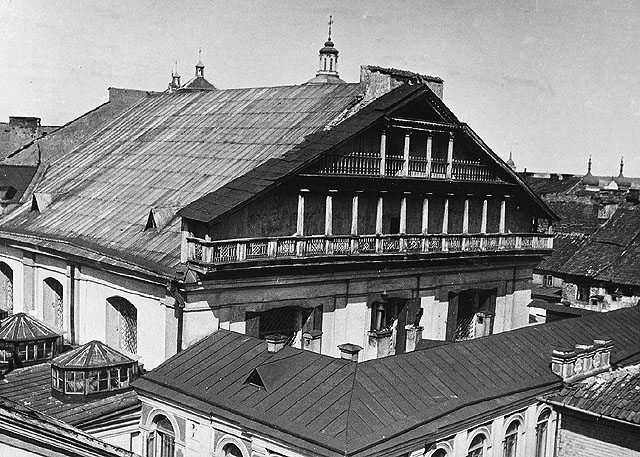 After the war the synagogue and the whole schulhoif complex were destroyed by the Soviet authorities and replaced by housing blocks. Three original pieces from the Great Synagogue of Vilna survived the destruction quite miraculously and are now on display at the Vilna Gaon Jewish Museum: a door of the Holy Ark, a reader’s desk (Omed), and a bas-relief with the Ten Commandments.